Udaipur is a big centre for wooden toys. The craftsmen use the local wood ?doodhia? which is soft and can be finely chiselled and shaped. The toys are lacquered and polished with leaves of a flowering cactus to give them a better look and increase their life. The large variety of toys made in Udaipur include the cart drawn by a sparrow, kitchen sets, grinder, cradle on a stand, gas lantern, gramophones, trains, cars, jeeps, aeroplanes, counting stands, and clock towers. Animal figures include horses, camels, and elephants. Udaipur is also famous for imitation dry fruit which bear a striking resemblance to the real fruits. Bassi in Chittorgarh district is another noted centre for wooden toys where the entire village is engaged in wood-carving and in making wooden products. 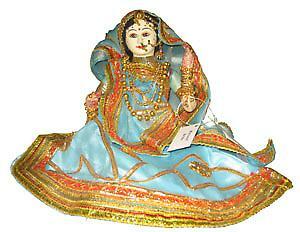 Jaipur too is very well known for cloth dolls and toys which are generally dyed and stuffed with waste material. These toys are beautifully decorated with colourful paper with expression writ large on their faces.